Marshall come on you know Myra was looking forward to the first attack. Gosh, you killjoy. BIG NEWS, Y’ALL. THIS WEEK ONLY is a big SKIN DEEP SUMMER SALE!!! ALL SKIN DEEP BOOKS AND BOROGOVE ARE $10 OFF! Limited edition hardcovers are $90! Signed books are $25! Regular books are $15! Borogove is also $15! Golly! This only goes on for a WEEK so if you were thinking of getting some sweet merch NOW IS THE TIME. Do you want some SWEET MERCH but don’t have the shelf space for it?? Well shucks howdy I got a BUNCH OF PDFs for sale! 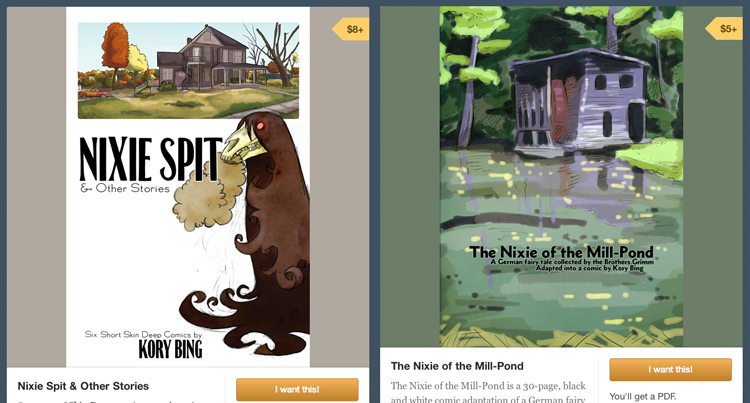 NEW PDFs like Nixie of the Mill-Pond, my fairy tale comic from Cautionary Fables and Fairy Tales, and NIXIE SPIT, a collection of 6 Skin Deep comics that have not been collected in book form yet. I also have ALL MY OTHER BOOKS for sale as PDFs AND THREE SKETCHBOOKS full of material not posted anywhere online! So please please please, if you were ever considering buying some sweet Skin Deep merchandise, now is the time to do it! Is this the comic with the least amount of dialogue? Or was their a ‘silent’ comic a while back? What are you talking about? The comic was filled to the brim with dialogue just a few pages back and all over from the beginning of Greetings From Dogpatch. Just because a few pages don’t have lots of dialogue doesn’t mean it’s a silent comic or that a few pages have lots of dialogue means its all about dialogue. It’s all mixed up with dialogue and action and this is just how Kory wants to present it. I’m pretty sure Q? was refering to the page rather than the arc, and I don’t think it was meant as a complaint anyway, just an observation. You are correct mage_cat, but in future I should probably say ‘page’ all the same. NasiDe please calm down. Holey Crow! I’m so sorry…. The black dragony-thing actually looks really cute. If I can get a warranty on it and a written guarantee that it won’t devour my soul, body, or life energy, I want one! Granted. Have a kiss from your new demonic pet. I have been reading you webcomic for a while and I love it. I can also say I want a bugabear plushie.